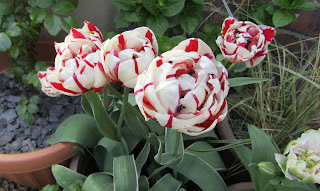 As promised, here is the third and final post about tulips this year. Above is Angelique, a really frilly, blowsy, over-the-top tulip. A couple of the flowers are multi-headed too. 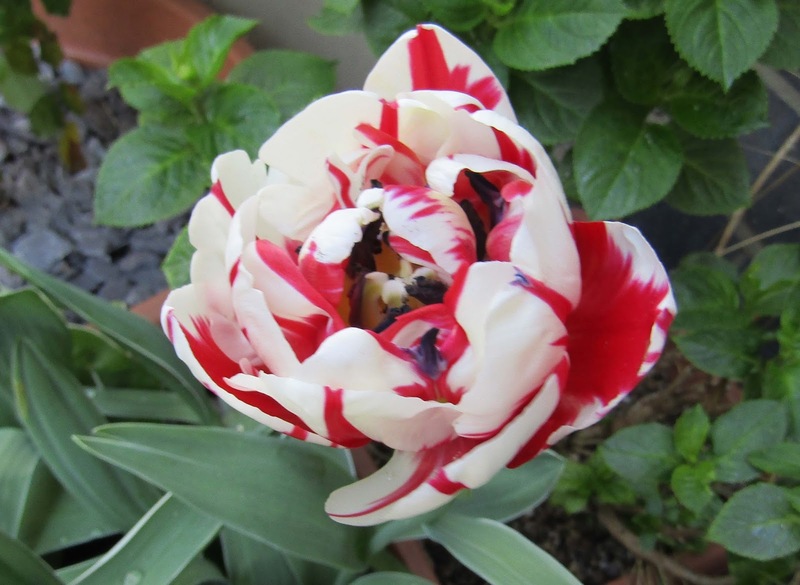 In case that just wasn't over-the-top enough, here is Carnaval de Nice in bold stripes. Another one which demands to be admired. They do make quite a display! ...and I noticed yellow of some of the petals in the tulip at the back which I thought was quite unusual. 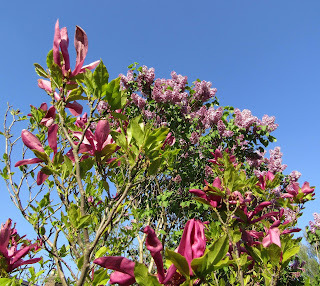 Magnolia Susan, backed by the lilac tree looked wonderful against the Mediterranean blue sky we had over the bank holiday weekend (almost unheard of to have sunny and hot weather on a bank holiday - usually, it is dull and rainy). 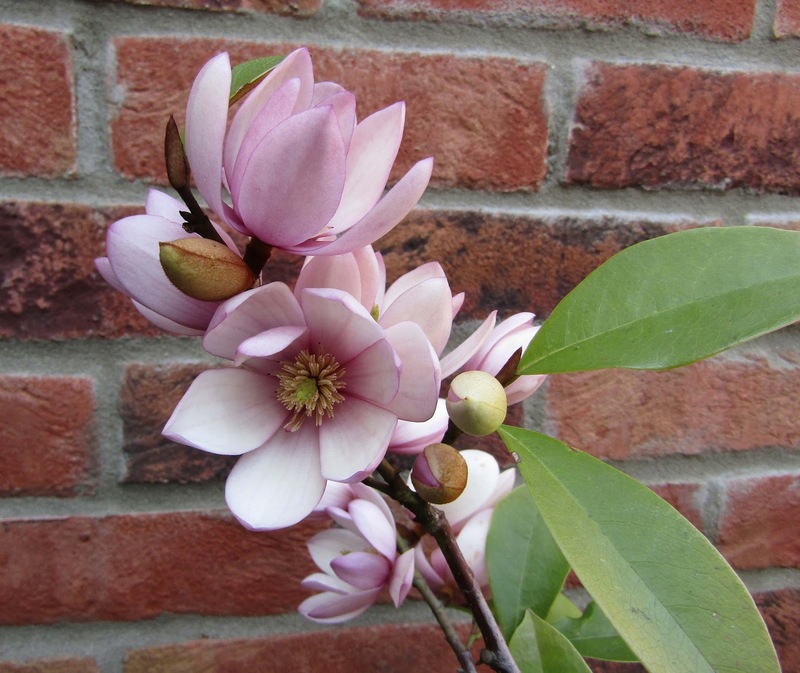 Finally, here is Magnolia Fairy Blush which took a battering when the wall fell on it and which looked like it was sulking all through the winter. In fact, I did think about removing it as it looked so unhappy and lost a large proportion of its leaves. However, when the flowers look like this, how can I get rid of it? Just beautiful. Lovely flowers and great photos . 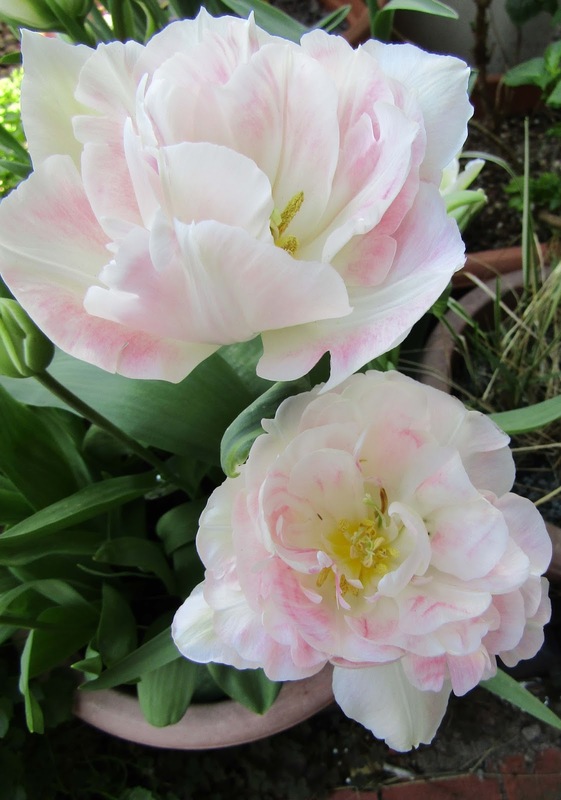 Love the tulips - and the magnolia. I hope to have tulips in six months or so. Sadly after the cockatoos destroyed yet another magnolia tree I have given up on planting them. Beautiful things which I admire in other people's garden. Thanks, EC. It's sad that the cockatoos destroyed your magnolias - what little vandals. I would love to have a space big enough to have a huge magnolia tree (or two), but my two small trees/shrubs give me lots of pleasure in the meantime. Thanks, Chrissie. 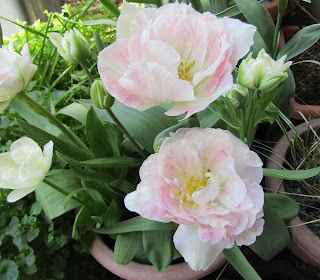 The tulips do look a bit like peonies or roses. Some of my tulips have done really well, some haven't, but I think it was to do with the really cold weather we had at the end of February/beginning of March. The magnolia had looked awful during the winter but has more than made up for it with the flowers at the moment, so it is allowed to stay! Some plants are incredibly resilient, aren't they? WOW, I've never seen Tulips like those red and white almost striped ones. Gorgeous. Thanks, Sandy. They are very eye-catching, aren't they? They're called Carnaval de Nice and are very bright and bold. Beautiful flowers, Ellie! Especially love the Magnolia! 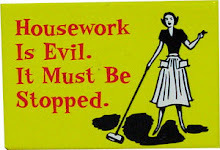 Thanks, Barbara. I am very fond of the magnolias too and Fairy Blush has somewhat redeemed herself by flowering so well. Magnolia Susan has been very reliable and I always enjoy her scented blooms. Thanks, Beth. They definitely demand attention, don't they? 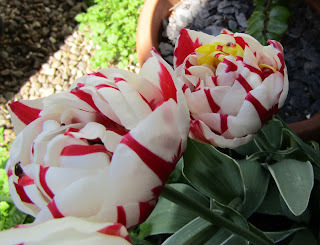 I have my eye on some really peony-like ones called Danceline - one for next year!